Denial: Roadblock to better health and better care. STATEMENT: Carol’s having a little problem with her memory. Initially this might be an accurate statement. Two years later, it’s a euphemism that doesn’t benefit anyone, the least of which is Carol. Imagine denying a person’s cancer diagnosis. There’s no need to treat it. I just have an uncontrolled division of abnormal cells in my body. It’s not that bad. It’s early in the diagnosis anyway and I’m not even experiencing any major symptoms. I’ll do something about it when it really gets bad. Ill-advised, right? Most people would not follow that path. But Alzheimer’s disease, and other dementia, are no less serious. As a matter of fact, cancer isn’t always fatal, but Alzheimer’s is. There is no cure and no potential for one at this time. Most people would spring into action upon receiving a cancer diagnosis: learning as much as possible about it; taking measures to curtail the cancer’s effects on their lives. The sooner one does something about it, the better the chances of successful treatment. For some reason, when a person receives an Alzheimer’s diagnosis there’s a self-inflicted stigma attached to it; as if the afflicted person brought the condition on themselves. This is an unfortunate perception and one that should be put to rest. Whereas clinical depression or mental illness used to be a taboo subject, those conditions are now more readily accepted in the public eye. Alzheimer’s must be brought out into the open, especially as it affects you or a loved one. The window of opportunity to start early drug therapy can be a very narrow one. The time to seek medical assistance is when symptoms become fairly consistent and more than just a “senior moment.” A thorough medical exam should be conducted to rule out any cause other than dementia. Some medical conditions and/or medication usage can mimic cognitive decline. All the more reason to act early to rule out what might be a readily fixable temporary condition. If after the thorough medical exam a cognitive workup is warranted, you’ll have a defined cognitive baseline and can start treatments and/or make adjustments in the household that will minimize the disease’s impact on your lives. Now you’re in the driver’s seat, regaining some amount of control over the disease. Those close to you need to be informed. As mentioned in an earlier post, “Caregiving: The Ultimate Team Sport” (article located in the “Caregiving” tab) you can’t assemble a care team if you’re ignoring the needs and challenges facing you and your loved one. You’ll be amazed at the relief you’ll feel knowing that you’re not battling this disease on your own. Let your family and close friends know early on what you need from them. Partner with them to become a formidable force upon which you can rely. You need support and it’s available from several resources. Join a local Alzheimer’s Association support group. The Alzheimer’s Association lists support groups in most geographical regions that should prove extremely helpful to you. Type in your zip code in the “Find Us Anywhere” upper right area of their website and you’ll be connected with the Chapter located nearest to you. Within that local Chapter you’ll then be able to search for a support group by typing in your city, county, or zip code. You’ll find groups for family members who are attempting to support their loved one who has received a dementia diagnosis. You might also find support groups for patients who are in the earliest stages of their illness. Both groups can do much towards providing you with confidence and hope when none can be found. These groups become a practical resource into which you can tap to benefit from others’ experiences in managing the disease. If by chance there is no nearby Alzheimer’s Association Chapter, check with your local hospitals, community colleges, senior centers, and the like as they oftentimes hold groups that are facilitated by trained professionals. These alternative groups are very adequate options when no other groups are available. If you or a loved one has received an Alzheimer’s/dementia diagnosis, you’ve just entered one of the most difficult chapters of your life. You deserve all the support and medical attention you can get. Ignoring the condition doesn’t make it any less real so please take the steps needed to manage this stage of your life effectively. This entry was posted in Alzheimer's/Dementia, Caregiving, Health & Wellness and tagged Alzheimer's, Alzheimer's Association, caregiver support groups, dementia. There are diagnostic tools in place that try to make sense of the symptoms of Alzheimer’s and other dementia; some are conclusive, while others are simply an educated guess because knowledge of this disease is evolving day by day in the medical and scientific fields. And for certain, no two people with the disease have the same manifestation thereof. Whether or not an actual diagnosis is presented, you as family members, or perhaps as the patient, are struggling with this new reality and are attempting to carry on as normally as possible. In the days ahead I am going to submit four articles addressing some of the challenges inherent with this disease. I am not an expert – I have no PhDs and no medical degrees – but what I do offer is advice gleaned from my own practical experience and from that of those with whom I have been fortunate to be acquainted. Preserving your loved one’s dignity. 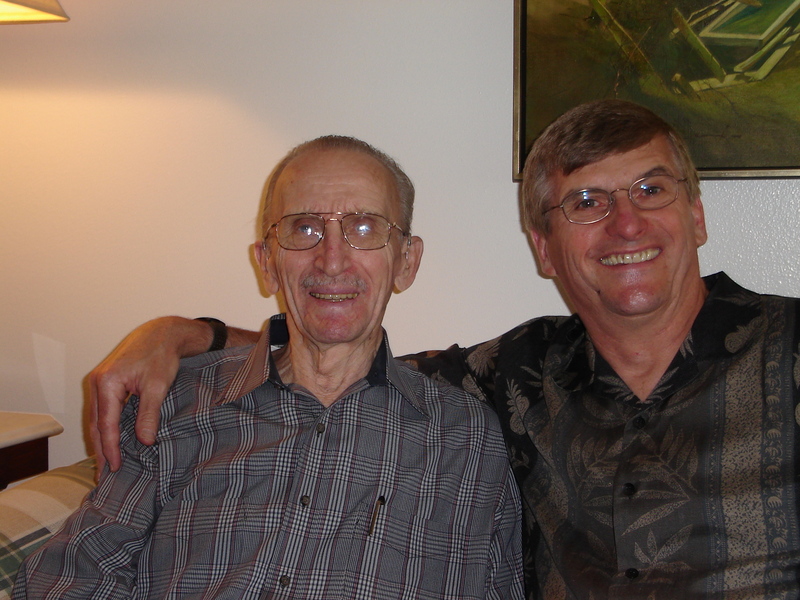 My wonderful brother Don, and our dad in June 2005, a year after dad's Alzheimer's diagnosis. I hope that ALL of us will have something to offer as these four articles are presented. I covet your input and hope that you feel free to provide it. This entry was posted in Alzheimer's/Dementia, Blog Category Headlines, Caregiving, Family issues, Health & Wellness and tagged Alzheimer's, dementia, driving with dementia, long distance caregiving. Adult children: taking care of an abusive parent. When an adult child’s earlier relationship with a parent has been wrought by abuse, how does the child manage to provide care to this parent who reigned verbal, physical, and/or sexual abuse upon him/her? Is caregiving required of an adult child in this circumstance? No. Is the child wrong to turn his or her back on a parent requiring care and attention? Absolutely not. Every individual’s situation is unique due to the extreme nature of this type of family dysfunction. There truly is no textbook answer that fits each circumstance. Not only is the situation unique but we’re talking about emotions – and how one deals with those emotions. We’re talking about the balance of how the previous harm has been handled and whether or not contact of a caregiving nature may prove newly damaging to the adult child/victim. For the purposes of this article, we will assume that the adult child has decided to participate in her abusive parent’s caregiving. CAVEAT: Anything I offer in this article is not based on personal experience, but rather, experiences that have been relayed to me through my work with adults who are also caregivers for their parent. I’m not an expert, I’m only an observer. I covet any input that my readers may be able to offer. The caregiving well is shallow. More likely than not, the well from which the child can draw may be very shallow. If the adult child has chosen to keep her distance from the abusive parent for many years, being suddenly thrust into one of the most difficult jobs she will ever perform could be a next to impossible task. Let’s say that she has decided to give it a try but she has been wise enough to set up an escape route that she will follow when the going gets tough. I don’t necessarily mean an actual, physical escape route. Rather, she has established the upper limit that she will bear should matters get out of hand emotionally or physically. She makes a commitment to herself that sets a comfortable threshold after which she will walk away, guilt free, knowing she made a valiant effort. She is strong enough to acknowledge that at some point she may need to cease all caregiving efforts. As I mentioned in a September 2011 Blog entry, “Deathbed promises and how to fulfill them,” (found in the Caregiving category of this site) even adult children with a fabulous relationship with their parent struggle greatly in their caregiving efforts. Whether you end up being a hands-on caregiver (providing the care in your parent’s home or yours) or you find yourself as the primary family contact with the staff caring for your parent at a long-term care (LTC) facility, you are pulled into the intimate aspects of a parent’s life and it is not an easy role in which to function. Feeling obligated vs protecting oneself. Too often, we do things out of a feeling of obligation rather than heartfelt compassion. In the situations outlined above, obligation will either be the only thing that places you in the caregiver role, or it will convince you that you’re not emotionally available to walk down that rut-filled path. I am an advocate for vulnerable adults – I live by that mantra – but in this situation I feel that the person needing the most advocacy is the adult child who still struggles with the effects of a past abusive relationship with a parent. If you are not able to provide the caregiving, please know that there are others who can do so in your place. You don’t have to be “it” ‘in this situation, and having someone else step in could very well be the best caregiving scenario for you, and your parent. If you ever find yourself in this role, please do not act alone. The community around you: churches, local government health service organizations (such as that found in Washington State), organizations that protect the abused, are an absolute required tool in your toolbox to be an effective caregiver, and an emotionally protected adult child. Anyone out there who has been in this role or is currently in this role of taking care of an abusive parent? Your input is very valuable and could very well help those struggling with this scenario. If you feel strong enough to share your story you have my thanks for opening up on this Blog. This entry was posted in Caregiving, Family issues, Health & Wellness and tagged abusive parent, family dysfunction, family obligations, pain threshold. I’m truly grateful for this posting by Morris in his Musings from Third Base blog. My mother always told me that you don’t have to look very far to locate someone worse off than yourself. That doesn’t mean you ignore the valid feelings of desperation or frustration that one feels from time to time – especially as we become more and more of a Baby Boomer. But what it does mean is that we can probably honestly say that we also have a few reasons to celebrate during this stage in our lives. I don’t wait for the grandiose, huge reasons to celebrate – I don’t want to wait THAT long. Instead I celebrate even the smallest of accomplishments, or good times; that way I have far more celebratory moments in my life. Forget about not SWEATING the small stuff. Let’s CELEBRATE the small stuff that give us reasons to be grateful. This entry was posted in Blog Category Headlines, Health & Wellness. 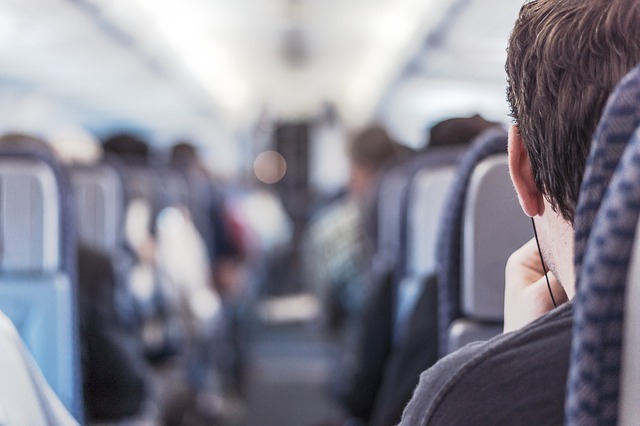 Caregiver: put on your oxygen mask first. Why? Unless the able-bodied person is fed oxygen, he won’t be able to help any one else. Whether you are actively providing care to your loved one or you are the point-person managing that care, you are stretched thin. Your tank is nearing empty. You’re on the path to caregiver burnout – or you’ve already arrived. you’re responsible for your aging parent’s, or spouse’s, day-to-day maintenance. Not only are you burning the midnight oil; you’re burning the candle at both ends and about to self-destruct. Oftentimes what happens in these situations is a person ends up being of no good to anyone. Your loved one for which you provide care is doing just fine because he/she is receiving all of your attention. Keep this up and you’ll be no good to anyone because a vehicle doesn’t run on an empty tank and neither can you. It’s time for you to attend your own “care conference” to come up with a realistic plan of how to direct your own health and well-being. You weren’t put on this earth to help everyone and despite your well-meaning belief that you can do it all – you can’t, and you’ll never be able to do so. Write a list of everything you currently feel obligated to do each week. Now cross out a third of that obligation list. Do what you can to delegate duties and/or designate other willing people to carry a third of your burden. You should already start feeling better. Now eliminate – or temporarily withdraw from – another third of your obligations. You won’t offend others by doing so if they know you well enough to understand your reasons for stepping back a bit. I’m certain they know that they will be able to count on you later when your life situation isn’t so acute. You’re not dropping out, you’re just putting yourself on pause. Reconnect with the family in your household. Don’t risk losing your family. You need them on your team and they need you. They will be around long after the loved one for whom you’re providing care passes away. You want your family with you now, and you’ll want their support later. Assemble a caregiving team. In my blog entries: Caregiving: The Ultimate Team Sport and Solo Caregiving I address the importance of reaching out to others and tapping into resources that will help you stay sane and healthy while on this caregiving path. You owe it to yourself, and your loved one, to start taking care of yourself. So place your own well-being at the top of your priority list. I can pretty much guarantee that you won’t regret it. This entry was posted in Caregiving, Family issues, Health & Wellness, Uncategorized and tagged Caregiver burnout, respite time for the caregiver. I sang for my Dad today … January 30, 2011. I am so pleased that I FINALLY figured out how to post someone else’s blog entry and I do so with this one by Lark Elizabeth Kirkwood. How wonderful that Lark was able to have that musical connection with her father at that time in his disease. One of the last songs I sang to my father, a couple hours before he died, was “Aloha Oe” which is a good-bye song in Hawaiian. I know he heard the song as he rode on the wave of departure from this Earth. Reading Lark’s many posts about the positive effects of music on those with dementia or brain injuries is so timely as I am still reeling from the positiveness of Diane Sawyer’s 20/20 program on ABC that was broadcast earlier this week. Her story of Gabrielle Giffords and Mark Kelly was inspirational on so many levels. Music had, and continues to have, an AMAZING healing effect on Congresswomen Giffords recovery from that horrific gun shot injury on January 8th, 2011. This entry was posted in Alzheimer's/Dementia, Blog Category Headlines, Caregiving, Health & Wellness. If your loved one no longer has a voice in which to defend or advocate for herself, who better to do so than you? In this post I will assume that your loved one, e.g., parent, grandparent, spouse, or sibling, lives in a long-term care (LTC) facility. Oftentimes by the time our parent has entered a facility, we are so relieved that someone else has taken over the caregiving, we willingly take a back seat and let the professionals do their job. By all means, reward yourself with the freedom that less active caregiving of your loved one has afforded you, but don’t leave your caregiving role behind. this place couldn’t possibly have any problems as witnessed by the waiting list we had to climb to get her accepted. I wish all of the above points were reason enough to become somewhat removed from the picture but the truth of the matter is that none of the above have any bearing on the quality of care being provided to your mom. Let’s take each point separately. Without a doubt, there are caregivers and management staff that truly do love what they do and this attitude is demonstrated in the compassionate way in which they care for your loved one. However, in 2007, studies showed that staff turnover rates ranged from 50 percent to well over 300 percent a year! There’s a reason why caregiver turnover is so high. This job is TOUGH and the pay is unconscionably low. A 2004 U.S. Dept. of Health and Human Services report addresses the front line long-term care workforce challenges which have only increased in the past several years. This report is worth your while to read. Learning is power – right? Champagne and chandelier facilities are just that – beautiful buildings on their face, but not necessarily representative of the care being provided. Don’t get me wrong, I’m aware that stellar higher-end senior housing companies exit, but it’s important that we not be lulled into thinking that glitz equals great. Sometimes what I call “generic” buildings oftentimes provide as good or better care. The waiting lists that so frequently exist for LTC facilities – especially for dementia care – are representative of the demand for space that, as of 2011, is not adequate for the burgeoning influx of Baby Boomers needing care. So a waiting list does not necessarily represent quality. So here are some pointers for you that I hope encourage your continued involvement in your loved one’s care. SPEAK UP. You don’t have to be a squeaky wheel to get the grease. Take the time to be a part of your loved one’s care meetings/conferences with staff to discern their reasons for the care being provided. Be present: in person if you live nearby or by phone if you are a long distance family caregiver. Trust me, if the caregivers know that you care and are going to be an active family participant, you’ll get their attention, and so will your loved one. OBSERVE. When visiting your loved one, observe her behavior and demeanor; her cleanliness and her appearance. How does it differ from visit to visit? Is her room tidy, clean and uncluttered? One way to observe staff members in action is to accompany your mom on facility outings. Observe the staff’s interaction with the residents. Do they speak respectfully to them? Are they patient with them? Do the residents enjoy their outings or do you get the impression that these outings are forced upon them? All of these impressions are important towards discerning what goes on in your absence. ADVOCACY RESOURCES. Do your part in acquiring the tools needed to better understand the resident rights guaranteed by law that your loved one should be receiving as a long-term care facility resident. Each state in this country has a LTC Ombudsman program. Get acquainted with their mission of advocating on behalf of vulnerable adults and contact your local program to receive help in assuring optimal care for your loved one. This entry was posted in Alzheimer's/Dementia, Caregiving, Health & Wellness, Senior Housing and tagged Baby Boomers, caregiver staff turnover, LTC Ombudsman Program, vulnerable adults.